Unmaad, the annual cultural fest of IIM Bangalore and the biggest B-School fest in the country, is back and we are proud to partner with them since their theme this year is Travel! Unmaad is the annual cultural festival of Indian Institute of Management Bangalore. Conducted over a period of three days, Unmaad includes events like dramatics, music performances, dances, quizzes, debates, street plays, professional concerts, and fashion shows. The first edition of Unmaad Festival was held in 1996 and since then it has been an integral part of life at IIM Bangalore. The 22nd version of Unmaad, based on the theme ‘A Wanderer’s Paradise’, which will transport its attendees to a global village, will be held from 2nd to 4th of February. This Unmaad promises to be an exciting array of Dance, Drama, Music, Fashion, Lits, Quizzes and a ton of online events! With exciting performances by Farhan Akhtar and Varun Thakur lined up for the final Pronite on Feb 4th, the event has already witnessed record registrations. 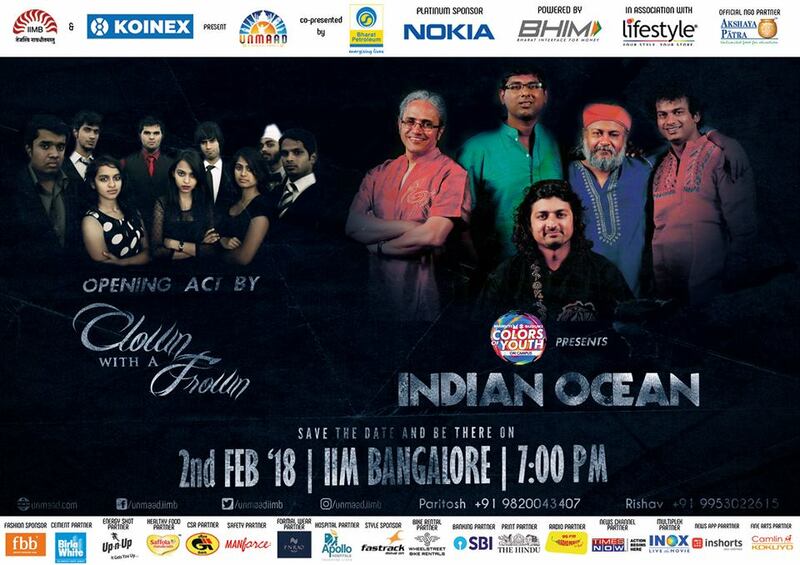 There is also a performance by the Indian Ocean scheduled on Feb 2nd, which allows free entry for all. Like last year, the ‘World Cultural Fiesta’ will witness some superb performances by extraordinarily talented international artists. With amazing participation in its outreach events so far, including a treasure hunt on bikes, ‘Road To Unmaad’, and several online events, this three-day extravaganza has already set the excitement rolling! Unmaad has a host of events lined up to entertain people across all age groups and participation from over 400+ colleges across the country. There’s prize money of `11+ lakhs to be won this year. Further details are available on the official website here. Sounds interesting! Have fun guys! !